The German national football team ( ) is the football team representing the country of Germany in international competition since 1908. It is governed by the German Football Association DFB (Deutscher Fußball-Bund) which was founded in 1900. From 1950 to 1990, the team was called West Germany in English, as since World War II, the DFB is based in the Federal Republic of Germany (FRG) which was commonly referred to as West Germany from 1949 to 1990. The DFB continues to field the German national team that had been fully reinstated by FIFA after the 1950 FIFA World Cup, retaining all records and traditions. Under Allied occupation and division, two other separate national teams had also been recognized by FIFA, the Saarland team (1950–1956), and the East German team (1952–1990). Both have been absorbed into the current national team, along with their records (caps and goal scorers). The official name and code "Germany FR (FRG)" has been shortened again to "Germany (GER)" since 1990. Germany is one of the three most successful national teams at international competitions, having won a total of three World Cups and three European championships. They are also one of the most consistent teams. Aside from winning three world and continental titles, they were also runners-up three times in the European Championships, four times in the World Cup and won 3rd place in the World Cup three times as well. East Germany won Olympic Gold in 1976. Germany is the only nation to have won both the men's and women's World Cups. The current coaching staff of the national team include head coach Joachim Löw, assistant coach Hans-Dieter Flick, goalkeeper coach Andreas Köpke, athletic coach Mark Verstegen, athletic coach Oliver Schmidtlein, scout Urs Siegenthaler, technical director Matthias Sammer and team manager Oliver Bierhoff. Between 1899 and 1901, prior to the formation of a national side, there were five unofficial international matches between different German and English selection teams, which all ended as large defeats for the German teams. Eight years after the establishment of the German Football Association (DFB), the first official match of the Germany national football team was played on 5 April 1908, against Switzerland at Basel , with the Swiss winning 5-3. Coincidentally, the first match after World War I in 1920, the first match after World War II in 1950 when Germany was still banned from most international competitions, and the first match in 1990 with former East German players were all against Switzerland as well. Germany's first championship title was even won in Switzerland. At that time, the players were selected by the DFB as there was no dedicated coach. The first manager of the Germany national team was Otto Nerz, a school teacher from Mannheim , who served in the role from 1923 to 1936. The German FA could not afford travel to Uruguay for the first World Cup staged in 1930 during the Great Depression, but finished third in the 1934 World Cup in their first appearance in the competition. After a poor showing at the 1936 Olympic Games in Berlin, Sepp Herberger became coach. In 1937 he put together a squad which was soon nicknamed the Breslau Elf (the Breslau Eleven) in recognition of their 8-0 win over Denmark in the then German city of Breslau , Lower Silesia (now Wroclaw, Poland). After Austria became part of Germany in the Anschluss of March 1938, that country's national team – one of Europe's better sides at the time due to professionalism – was disbanded despite having already qualified for the 1938 World Cup. As required by Nazi politicians, five or six ex-Austrian players, from the clubs Rapid Wien, Austria Wien, Vienna Wien , were ordered to join the all-German team on short notice in a staged show of unity orchestrated for political reasons. In the 1938 World Cup that began on 4 June, this "united" German team managed only a 1-1 draw against Switzerland, and then lost the replay 2-4 in front of a hostile crowd in Paris, France. That early exit stands as Germany's worst ever World Cup result. During World War II, the team played over 30 international games between September 1939 and November 1942, when national team games was suspended as most players had to join the armed forces. Many of the national team players were gathered together under coach Herberger as Luftwaffen-SV Hamburg through the efforts of a sympathetic air force officer trying to protect the footballers from the most dangerous wartime service. 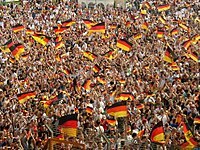 After the Second World War, Germany was banned from competition in most sports until about 1950, with none of the three new German states, West Germany , East Germany and Saarland, entering the 1950 FIFA World Cup qualifiers as the DFB was only reinstated as full FIFA member after this World Cup. As in most aspects of life, the pre-war traditions and organisations of Germany were carried on by the Federal Republic of Germany , which was referred to as West Germany . This applied also to the restored DFB which had its headquarters in Frankfurt am Main and still employed coach Sepp Herberger. With recognition by FIFA and UEFA, the DFB maintained and continued the record of the pre-war team. Neighboring Switzerland was once again the first team that would play (now West) Germany in 1950, with Turkey and Republic of Ireland being the only non-German speaking nations to play them in friendly matches during 1951. After only 18 post war games in total, West Germany had qualified for the 1954 World Cup, having prevailed against Norway and the "third German state", the Saarland. The Saar protectorate, otherwise known as Saarland , had been split from Germany and put under French control between 1947 and 1956. Saarland did not want to join French organisations and was barred from participating in pan-German ones. Thus, they've sent separate teams to the 1952 Summer Olympics and also to the 1954 World Cup qualifiers, when Saarland finished below West Germany but above Norway in their qualification group, having won in Oslo. Legendary coach Helmut Schön was the manager of the Saarland team from 1952 until 1957, when the territory acceded to the Federal Republic of Germany. He went on to coach the championship-winning team of the 1970s. In 1949, the socialist German Democratic Republic was founded in the Soviet-occupied central part of Germany (most of the eastern part was put under Polish administration). From 1952 onwards they were represented by a separate FA and its East Germany national football team. East Germany were also the only team able to beat the West German team that won the 1974 World Cup, a highly symbolic event for both sides of the nation, which remained the only meeting of both teams. East Germany went on to win the gold medal at the 1976 Olympics. After the fall of the Berlin wall in 1989, the GDR dissolved itself, its new federal states joined the Federal Republic of Germany in the German reunification in 1990, and the football clubs and players joined the DFB. West Germany, captained by Fritz Walter, met in the 1954 World Cup some of the teams they had played in friendly matches, namely Turkey, Yugoslavia and Austria. When playing favorites Hungary in the group stage, with good chances to qualify for the next round even in case of defeat, coach Sepp Herberger did not field his best players, saving them from the experience of a 3-8 loss. West Germany would go on to meet Hungary again in the final, facing the legendary team of Mighty Magyars again, which had gone unbeaten for 32 consecutive matches. In a shocking upset, West Germany came back from an early two goal deficit to win 3-2, with Helmut Rahn scoring the winning goal with only six minutes remaining. The success is called "The Miracle of Bern" (Das Wunder von Bern). The unexpected victory created a sense of euphoria throughout a divided postwar Germany. The triumph is credited with playing a significant role in securing the postwar ideological foundation of the Federal Republic of Germany. After finishing fourth in the 1958 World Cup and reaching only the quarter-finals in the 1962 World Cup, the DFB had to make changes. Following examples set abroad, professionalism was introduced, and the best clubs from the various Regionalligas were assembled into the new Bundesliga. In 1964, Helmut Schön took over as coach, replacing Herberger who had been in office for 28 years. In the 1966 World Cup, West Germany reached the final after beating the USSR in the semifinal, facing hosts England at Wembley Stadium . Wolfgang Weber's last minute goal took the game into extra time, a goal claimed to be controversial by the English, with the ball appearing to hit the hand of a German player as it travelled through the England penalty area before he prodded it in. The first extra time goal by Geoff Hurst, nicknamed Wembley-Tor (Wembley goal) in Germany, is still controversial after all this time. Later video evidence indicates that the ball never crossed the line after hitting the crossbar. As the Swiss referee did not see the situation properly, the opinion of the Soviet linesman Tofik Bakhramov who believed that the ball bounced back from the net rather than the crossbar led to one of the most contentious goals in the history of football. While the Germans pushed hard to tie the game, spectators entered the field in the final seconds, and Hurst scored another controversial goal giving England a 4-2 win. West Germany gained a measure of revenge in the 1970 World Cup by knocking England out in the quarter-finals 3-2, having been 2-0 down, before they suffered another memorable extra time loss, this time in the semi-final against Italy at Estadio Azteca . Karl-Heinz Schnellinger scored during injury time to level the match at 1-1, and during extra time, both teams held the lead at one time. Memorably, Franz Beckenbauer remained on the field even with a dislocated shoulder, his arm in a sling strapped to his body, as West Germany had used up their two allowed substitutions. Eventually won 4-3 by Italy, this match with five goals in extra time is one of the most dramatic in World Cup history, and is called "Game of the Century " in both Italy (Partita del secolo) and Germany (Jahrhundertspiel). While the exhausted Italians lost to Brazil, West Germany went on to claim third place by beating Uruguay 1-0, and Gerd Müller finished as the tournament top scorer with 10 goals. In 1971, Franz Beckenbauer became captain of the national side, and he led West Germany to great success as they became both the European and World Champions. They won the European Championship at their first attempt in Euro 72, after beating the Soviet Union 3-0 in the final. Then as hosts of the 1974 World Cup, they won their second World Cup, after beating the Netherlands 2-1 in the final at the Olympiastadion . Two matches in the 1974 World Cup stood out for West Germany. The first group stage saw a politically charged match as West Germany played a game against East Germany. Both teams already were qualified for advance to the next round, and the East Germans won 1-0. The West Germans adjusted their line up after the loss and advanced to the final which was the other outstanding match, against the Johan Cruijff-led Dutch team and their brand of "Total Football". Cruijff was brought down early in the German penalty area following a solo run before any of the German players had even touched the ball, and the Dutch took the lead from the ensuing penalty with just a minute gone on the clock. However, West Germany managed to come back, tying the match on a penalty scored by Paul Breitner, and winning it with Gerd Müller's goal just before half-time. A second goal by Müller was ruled offside. West Germany failed to defend their titles in the next two major international tournaments. First they lost to Czechoslovakia in the final of Euro 76 in a penalty shootout by a score of 5-3, after the match finished 2-2, with Uli Hoeneß famously kicking the ball sky high. Since that loss, Germany has not lost a penalty shootout in major international tournaments. In fact, the last penalty missed by a German player dates back to the semi-finals of the 1982 World Cup when French goalkeeper Jean-Luc Ettori saved Uli Stielike's shot. Then in the 1978 World Cup, they were eliminated in the second group stage after losing 3-2 to Austria which was already eliminated at that time, but surprised the Germans with their zeal to beat them anyway. Schön retired as coach afterwards, and the post was taken over by his assistant Jupp Derwall. West Germany's first tournament under Derwall was successful, as they won Euro 80 after beating Belgium 2-1 in the final, their second European title. West Germany then reached the final of the 1982 World Cup, but not without difficulties. They were upset 2-1 by Algeria in their first match, but managed to sneak into the second round with a controversial 1-0 win over Austria as the result advanced both teams at the expense of the Algerians. Then in their semi-final against France, they came back from 3-1 down during extra time to tie the match 3-3, and won the following penalty shootout 5-4. In the final, they were defeated by Italy by a score of 3-1. During the period of the 1970s and 80s, West Germany also achieved small success at the Olympic Games, most notably in the 1988 Olympics, when they won the bronze medal, while also reaching the Second Round in both 1972 and 1984. In the 1972 Olympics, West Germany played against East Germany in the second group stage, losing 3-2, one of only two major matches between the two German teams (the other one being the 1974 World Cup Group match, which also was won – 1-0 – by East Germany ). Toni Schumacher, along with Sergio Goycochea, holds the record for the most World Cup penalty shootout saves, with four. He saved two against France in 1982 and another two against Mexico in 1986. West Germany also has one of the world's most productive goal scorers in Gerd Müller, who racked up fourteen goals in just two World Cups. His ten goals in 1970 are the third most in a tournament, just behind France's Just Fontaine and Hungarian Sándor Kocsis. Though Müller's all time Finals score was broken by Ronaldo in 2006, it took the latter three tournaments to do so (1998, 2002, 2006). France's Just Fontaine is in third place all-time, with thirteen goals, all scored at the 1958 World Cup. After being eliminated in the first round of Euro 84, Franz Beckenbauer returned to the national team as coach to replace Derwall. In the 1986 World Cup, West Germany finished as runners-up for the second consecutive tournament, after again beating France 2-0 in the semi-finals, but losing to the Diego Maradona-led Argentina 3-2 in the final. In Euro 88, West Germany's hopes of winning the tournament on home soil were spoiled by the Netherlands, as the Dutch gained revenge of their loss in 1974 by beating them 2-1 in the semi-final. In the 1990 World Cup, West Germany finally won their third World Cup title in the unprecedented third consecutive final appearance. Captained by Lothar Matthäus, they were worthy champions as they defeated Yugoslavia (4-1), UAE (5-1), the Netherlands (2-1), Czechoslovakia (1-0), and England (1-1, 4-3 on penalty kicks) on the way to a final rematch against Argentina. In a dull match, West Germany won 1-0 with the only goal being a penalty scored in the 85th minute by Andreas Brehme. Beckenbauer, who won the title as captain in 1974, thus became the second person (after Mário Zagallo) to have won the World Cup as both a player and a coach, and the first as both a captain and a coach. In February 1990, months after the fall of the Berlin wall, the draw for the 1992 European Championship qualifying tournament had seen East Germany and West Germany drawn together in Group 5, scheduled to start in September. After the World Cup win, with assistant Berti Vogts taking over as the national team coach, the retiring Beckenbauer infamously predicted that the German team, with additional former East Germans to choose from, would be invincible for years to come. The reunification of Germany was confirmed in August to take effect on 3 October 1990, with the access of the former GDR to the Federal Republic of Germany. The members of the East German association Deutscher Fußball-Verband acceded to the DFB in November, while the 1990/91 seasons would continue, with the leagues being restructured for 1991/92. The first game which saw a unified German team including former East German internationals such as Matthias Sammer and Ulf Kirsten was against Switzerland on 19 December. In Euro 92, Germany reached the final, but lost 2-0 to surprise winners Denmark. As defending champions in the 1994 World Cup, they were upset 2-1 in the quarter-finals by Bulgaria after taking the lead. Germany won their first major international title after the reunification at Euro 96, becoming European champions for the third time. They defeated England, who were the hosts, again on penalty kicks (6-5, after a 1-1 draw) in the semi-finals, and the Czech Republic 2-1 in the final, a match decided by a golden goal scored by Oliver Bierhoff. However, in the 1998 World Cup, Germany were again eliminated by a less heralded opponent in the quarter-finals, this time in a 3-0 rout by Croatia. Vogts stepped down afterwards and was replaced by Erich Ribbeck. Entering the 21st century, Germany's standing as one of the best national sides in the world, and as of a team that almost always reaches the later rounds of major tournaments, was starting to be discouraged by disappointing results. In Euro 2000, the aging team went out in the first round after failing to win any of their three matches, including a 1-0 defeat to rivals England and an embarrassing 3-0 loss to a second-string Portugal side (the Portuguese having already advanced). Rudi Völler replaced Ribbeck as coach, initially on a temporary basis, and later permanently after planned successor Christoph Daum was involved in a drug scandal. Coming into the 2002 World Cup, expectations of the German team were low, due to poor results in the qualifiers, including a 5-1 home defeat against England. However, they started out strong by thrashing Saudi Arabia 8-0 in their first match. At the knockout stages, they produced three consecutive 1-0 wins, against Paraguay, the United States, and co-hosts South Korea, setting up a final against Brazil, the first World Cup meeting between the two. However, with the pivotal Michael Ballack suspended due to accumulated yellow card, Germany's chances had declined. In a hard-fought match, Germany lost 2-0. German captain and goalkeeper Oliver Kahn won the Golden Ball, the first time in the World Cup's history a goalkeeper was named best player of the tournament. Simultaneously, he won the Yashin-Award as the best goalkeeper. Germany failed to build on their success in 2002, and again exited in the first round of Euro 2004 without winning a match. As was the case in 2000, the Germans bowed out after losing to the second-string side of a team that had already advanced, in this case that of the Czech Republic, in a match where Germany dominated but couldn't get the ball into the net, losing to a Czech goal scored on the break. Völler resigned afterwards, denouncing the constant media criticism in a famous TV interview, and the national team had to find their third new coach in six years, after having had only six coaches in the previous 75 years. As prospective candidates including Ottmar Hitzfeld and Otto Rehhagel turned down the job, former national team player Jürgen Klinsmann, who had never held any coaching jobs before, was appointed. In similar style to Beckenbauer's former role as team manager without a coaching license, the experienced Joachim Löw from Stuttgart would assist him. Klinsmann made Michael Ballack the captain following Euro 2004. Klinsmann's main task was to lead the national team to a good showing at the 2006 World Cup, which Germany were going to host.Although the host nation, hopes prior to the start of the tournament proper were not as high for Germany as in previous tournaments, even in Germany itself. Critics had pointed out the apparent lack of quality players in the squad and coach Klinsmann's decision to live in America rather than Germany. Germany, however, won the opening game of the World Cup against Costa Rica 4-2. They continued to develop both confidence and support across the group stage, conceding no further goals as they beat Poland 1-0 and Ecuador 3-0, with Miroslav Klose scoring twice and Lukas Podolski adding another in the last match. Germany finished on top of the group with three wins. The team went on to defeat Sweden 2-0 in the round of 16, with Lukas Podolski netting both goals in only 12 minutes, from assists by Miroslav Klose. Germany faced favourites Argentina in the quarter-finals, a team that Germany had not defeated since the 1990 World Cup. Germany's shutout streak was broken shortly after half time as Argentina scored first to grab a 1-0 lead. However, Michael Ballack's cross, flicked on by Tim Borowski, allowed Klose to head in the equalizer with 10 minutes to spare. During penalties, Jens Lehmann stopped two spot kicks while his teammates made all of the necessary goals to win the decisive shootout 4 - 2. Afterwards, the Argentinians started a brawl, which later, after Italian TV showed video footage of Torsten Frings participating in the brawl, resulted in a ban for him. These results produced much expectation in Germany, many thinking that a record eighth appearance at the final was possible even though a vital player was missing, and the team was tired after going the full distance against one of the best teams. Taking the semi-final against Italy to extra time again, hopes grew high that yet another penalty shoot-out would take the team to the final in Berlin. Despite Klinsmann's focus on fitness, speed and concentration of German players faded, conceding two goals in the dying ninety seconds of the extra time. Despite having their dreams of playing in the final dashed, Klinsmann's squad quickly recovered their composure, and journalists noted the team's upbeat mood in the practices after the semi-final. Three starters, including captain Michael Ballack, would not be available for the third place match. They faced the Portuguese team, with goalkeeper Ricardo having only conceded one goal in regular play. Nonetheless, Germany thoroughly routed Portugal 3-1, at one point being up three goals to nil from Bastian Schweinsteiger's two goals and an own goal, also off his shot, by Portugal's Petit. Germany managed to end the World Cup on a high, not only with a 3-1 win over Portugal in the battle for third place, but also with several awards: Miroslav Klose was awarded the Golden Boot for his tournament-leading five goals, becoming the first player from the united Germany to earn it, and fellow striker Lukas Podolski won the 'Best Young Player' award. Furthermore, four of Germany's players (Jens Lehmann, Philipp Lahm, Michael Ballack and Miroslav Klose) were selected for the 'Mastercard All-Star Team'. In addition, at 14 goals scored, the German side put away more goals than any other team. At the end of the tournament, more than 500,000 people celebrated the team's closing ceremony by giving them a heroes welcome at the Brandenburg Gate in Berlin . Germany had a much better World Cup than many – at home and abroad ever believed possible. Germany's entry into the Euro 2008 qualifying round was marked, not least, by the promotion of Joachim Löw to coach. In a group with the Czech Republic and the Republic of Ireland among others, Germany qualified comfortably, defeating San Marino in a historic 13-0 record away win on the way. For the final tournament, Germany were placed into Group B alongside Poland, Croatia and longtime rivals Austria. Germany won 2-0 to Poland , but suffered an ignominious 2-1 defeat at the hands of Croatia, compounded by a red card for Bastian Schweinsteiger for an aggressive off-the-ball incident. Germany finally entered the knockout round with the victory over Austria in the last match of group play. The only scorer of the game was Michael Ballack, who scored in the 49th minute with a powerful long-distance free-kick, later chosen German Goal of the Year. Somewhat surprisingly at this stage, the team then defeated Portugal who won their group comfortably 3-2 in the quarterfinal. Germany went into their semi-final clash against Turkey as overwhelming favorites. However, the team put up a nervous and shaky performance, getting behind by an Ugur Boral goal in the 22nd minute. Bastian Schweinsteiger equalised, and Miroslav Klose put Germany ahead only for Semih Senturk to level the score in the last minutes of the match. Just as the game was heading for extra time, Philipp Lahm stole in at the near post to score in the final minute, sending Germany into the final against Spain, the strongest team of the tournament so far. The final was largely dominated by Spain which went up front by a goal by Fernando Torres in the 33rd minute. A rather weak German team had difficulties creating chances and only came near equalizing in the first minutes after half-time. As neither team scored after Torres' goal, although there was some controversy over the missed call involving a Spanish defender touching the ball with his arm in his own goal box, Germany had to content themselves with another silver medal. Recent history was marked by Löw's attempts to rejuvenate the squad, bring in new players such as René Adler or Serdar Tasci in order to spark internal competition, which has led to some disharmony in the squad. For the qualification for World Cup 2010, Germany were placed in a group with Azerbaijan (led by former Germany coach Berti Vogts), Finland, Liechtenstein, Russia and Wales. In their penultimate match on 10 October 2009, Germany secured first place in their qualifying group for the 2010 World Cup by beating second placed Russia in Moscow 1-0. Germany does not have a national stadium, and the national team's home matches are rotated among various stadia across the country. They have played home matches in 39 different cities so far - including venues which were German at the time of the match, such as Vienna which staged three games between 1938 and 1942. National team matches have most often (42 times) been held in the various stadiums of the city of Berlin . Berlin was also the venue of Germany's first home match in 1908 against England. Other common host cities include Hamburg (32 matches), Stuttgart (29) and Hanover (24). adidas AG is the longstanding kit provider to the national team, a sponsorship that began in 1954 and is contracted to continue until at least 2018. Nike, Inc. had been courting the team, and in August 2007 reportedly offered as much as €500 million to outfit the team for an eight-year period – a figure that is six times what adidas currently pays – but the federation decided to remain with Germany-based adidas. The current design was unveiled on the 10 September 2007, to mixed responses from German fans. The national team's home dress has always been a white jersey and black shorts. The colors are derived from the 19th century flag of the north German State of Prussia. The away jersey color has changed several times. Historically, green shirt with white shorts is the most often used alternative color combination, derived from the DFB colors (and the ones of a playing field), though it is also reported that the choice is in recognition of the fact that Ireland, whose home shirts are green, were supposedly the first nation to play Germany in a friendly game after World War II. This is false, as their first match after WWII was in fact against Switzerland. Other colours such as grey and black have also been used. The last change, from black to red, came in November 2004 on the request of Jürgen Klinsmann, citing that teams in red are statistically more successful, and perceived as more intimidating. He hoped to use the red away shirt as first choice for the 2006 World Cup despite less than impressive results when playing in these colors (for example, the 1-4 loss in Italy), but Germany played every game at the 2006 World Cup in its home white colors. In Germany, the team is typically referred to as the "Nationalmannschaft" (national team), "DFB-Elf" (DFB eleven) or "Nationalelf" (national eleven), whereas in foreign media, they are regularly described as the "Mannschaft" (literally meaning "The Team"). Germany has won the World Cup three times, behind only Brazil (five titles) and Italy (four titles). It has finished as runners-up four times, two more than any other side. In terms of semifinal appearances, Germany leads with 11, one more than Brazil's 10, which had participated in two more tournaments. In the last 14 World Cup tournaments, Germany has always reached at least the stage of the last eight teams. Germany has also qualified for every of the 16 World Cups it has entered — it did not enter the inaugural competition in Uruguay of 1930 for economic reasons, and could not qualify for or compete in the post-war 1950 World Cup as the DFB was reinstated as a FIFA member only two months after this tournament. Germany has also won the European Championship three times (France and Spain are the only other multiple-time winners with two titles), and finished as runners-up three times as well. The Germans have qualified for every European Championship tournament except for the very first EC they entered in 1968. For that tournament, Germany was in the only group of three teams and thus only played four qualifying games. The deciding game was a scoreless draw in Albania which gave Yugoslavia the edge, having won in their neighbor country. Germany played in the FIFA Confederations Cup twice, in 1999 (first round exit) and in 2005 (third place) as hosts. **Gold background color indicates that the tournament was won. Red border color indicates tournament was held on home soil. Players called up for the friendly matches against Chile and Côte d'Ivoire on 14 November and 18 November respectively. The match against Chile was cancelled following the suicide of Robert Enke on 10 November 2009. The Hannover 96 goalkeeper had been in previous squads but was omitted from the current selection following an injury. Caps and goals as of 18 November 2009. The following players have also been called up to the Germany squad within last 12 months and are still available for selection. Player withdrew from the squad due to an injury. Thomas Müller was originally called up for the under-21 qualifier against Northern Ireland on November 13, 2009 and set to join the senior team for the friendly against Côte d'Ivoire on November 18 thereafter. Following Robert Enke's death and the cancellation of the senior team's match against Chile (originally to take place on November 14), Germany manager Joachim Löw and U-21 manager Rainer Adrion decided to retain Müller at the under-21 team for the upcoming qualifier against San Marino on November 17. Below is a list of the 20 players with the most caps for Germany as of 14 October 2009 (* denotes players still available for selection). Players who had played for the separate East German Team, and then were capped for the DFB team (Ulf Kirsten: 100 caps in total, 49 for East Germany, then 51 for Germany), do not appear in this list, though they are included in FIFA records. Germany captains since Germany's first participation in a World Cup in 1934. Note: the column "games" signifies overall games as captain, not overall caps. Captained games outside the player's main period are also included. Michael Ballack 2004–present 54 Record as of 14 October 2009. Includes matches won or lost on penalty shootouts. Record includes periods of pre-division Germany (1936–1942 — 65 matches: 40 wins, 12 draws, 13 losses) and West Germany (1950–1964 — 97 matches: 52 wins, 14 draws, 31 losses; no national team matches and no national coaches between 1942 and 1950). Record as of 18 November 2009.